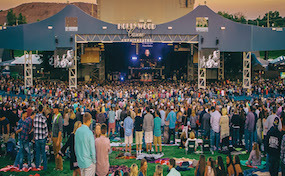 The Hollywood Casino Amphitheater is the premier spot in St. Louis to catch the touring summer concert series. The Hollywood Casino Amphitheater box office is located at 14141 Riverport Drive in Maryland Heights, Missourri. The Hollywood Casino Amphitheatre was constructed for approximately $12 million and opened June 14 1991 with a Steve Winwood concert. The Hollywood Casino Amphitheatre can accommodate up to 7,000 reserved seats with another 13,000 lawn. Some of the most memorable Hollywood Casino Amphitheater moments include the Riverport Riot caused during a Guns N' Roses concert and the recent Kings of Leon show where they left stage after three songs because of pigeon feces. Other names have included the Riverport Amphitheater and the UMB Bank Pavilion. Hollywood.AmphitheaterStLouis.com is not affiliated with any official website or primary box office. We are independently owned and operated concentrating in all sales in the secondary market. Tickets may be above or below face value. All tickets come with our 125% authenticity guarantee. To order all Hollywood Casino Amphitheater St. Louis events simply click on the show you wish to attend or call our operators at anytime.